Think you know Chinese values? Ever since Europeans first travelled to China centuries ago, Western accounts of this fascinating land often combined far-fetched fantasy with tantalizing fact. According to a recent study by the Asia Society, this conflated perception of China appears to be as true today as it was 500 years ago! So how can teachers, students, or anyone else separate history from hype? China Mirror was designed to help you to discern the facts for yourself. How? China Mirror Case Studies let the people of China speak for themselves through the letters, legal cases, treaties, artifacts and other things they produced. You be the judge of what real people once said through original documents and artifacts! 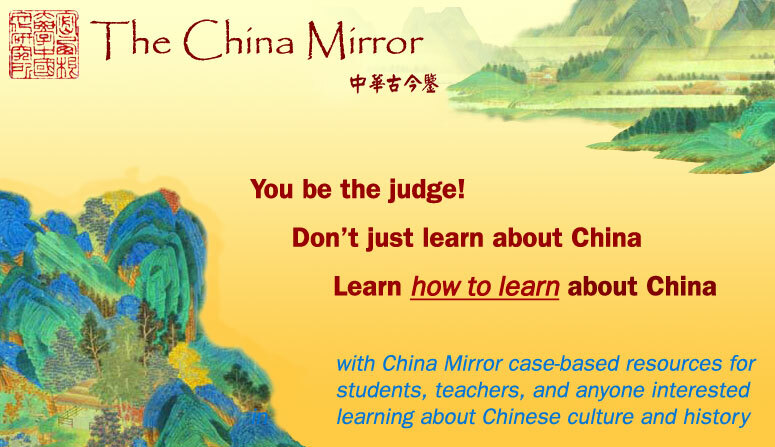 China Mirror Case Studies are your guide to reading original documents, so you not only learn about China—you learn how to read a treaty, a medical manual, or even a lady’s mirror. Each Case Study is written by internationally-recognized experts. The case studies provide critical assessments and multiple guides to critical thinking and global awareness so you can learn how to recognize hype, spin, or just bad logic. The China Mirror Project is backed by the University of Michigan Center for Chinese Studies, one of the world’s preeminent Centers of Chinese Studies, and one of the three largest centers in the United States. Note: All new and updated content is on this site, including all migrated content from the (old) China Mirror site.